On Saturday morning I donned my apron and decided to polish the bedroom furniture before settling in for an afternoon of sewing, but in the process I jammed my finger between two sections of our sleigh bed and now have a rather swollen pointer finger on my right hand. This slowed everything down for the remainder of the weekend, including my sewing plans. However, not one to give up easily, I followed my husband's wise advice, "No more housework for you until Monday" and slightly altered the original idea I'd had for finishing block 1 of my 2017 BOM as a mini quilt. It was going to be bordered with an elongated churn dash block but my injured pointer finger was needed to use the rotary cutter and this proved extremely difficult with so many small pieces of fabric to be cut. So I opted for two straight borders instead. To make the second border stand out I chose a fabric with a design which could be fussy cut and I'm so glad I did because I prefer this finish to my original churn dash idea. 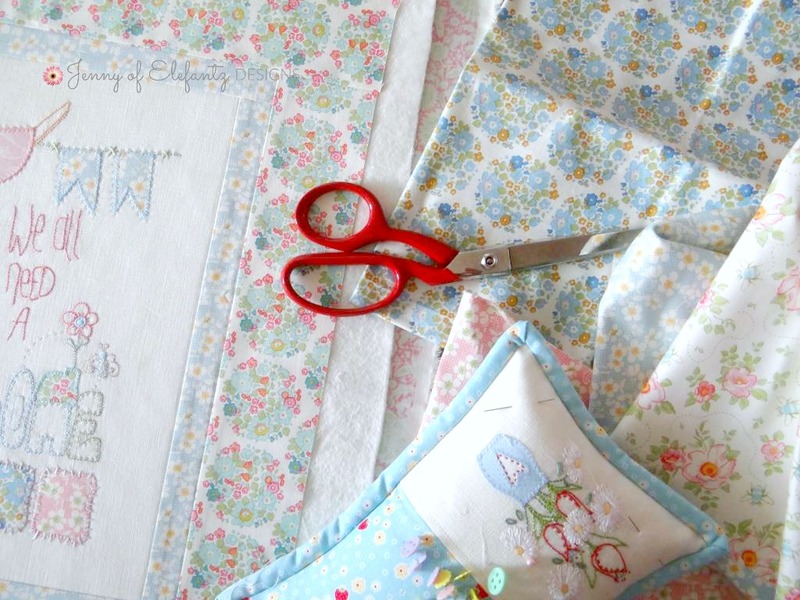 The right fabric can make all the difference for a border if you're keeping it plain, so next time you're finishing a stitchery as a simple mini quilt like mine, consider the fabric and whether it will compliment your feature block or 'steal the show'. When you have embroidery as the star of a project choose a fabric which will play a supporting role and not attempt to steal the spotlight. 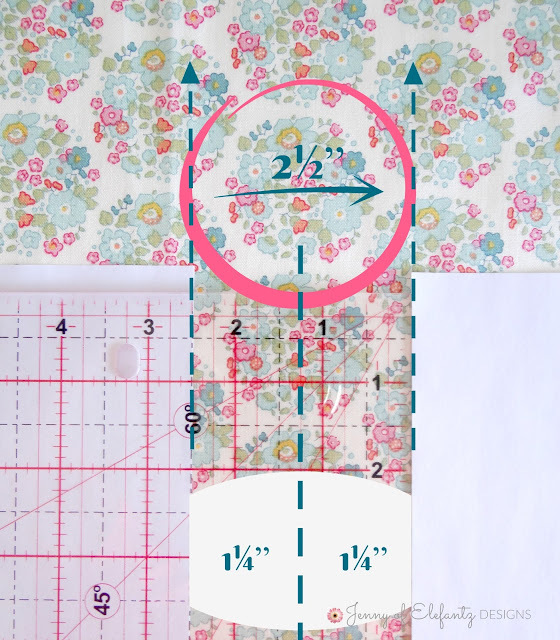 Then I cut four, 2½” wide lengths (from a fat quarter, otherwise I'd have only needed two lengths from yardage) and I was left with a little less than an inch of 'waste' fabric between each of my fussy cut pieces. Those cast off bits all go in to my applique scraps box and as I do a lot of applique they won't be wasted after all. Phew. I trimmed the embroidered block to to 9½” x 11½”. 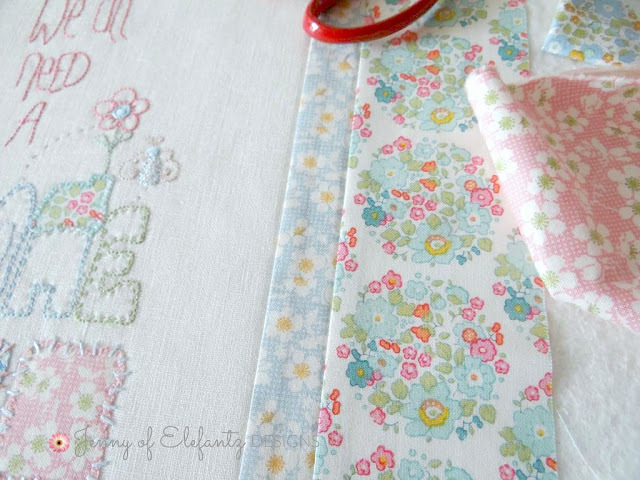 The narrow blue floral first border around the stitchery block was cut from a fat quarter (four, 1¼” wide lengths) and I had enough left over to make the binding for the mini quilt as well. A third fat quarter made up the quilt backing and hanging sleeve. 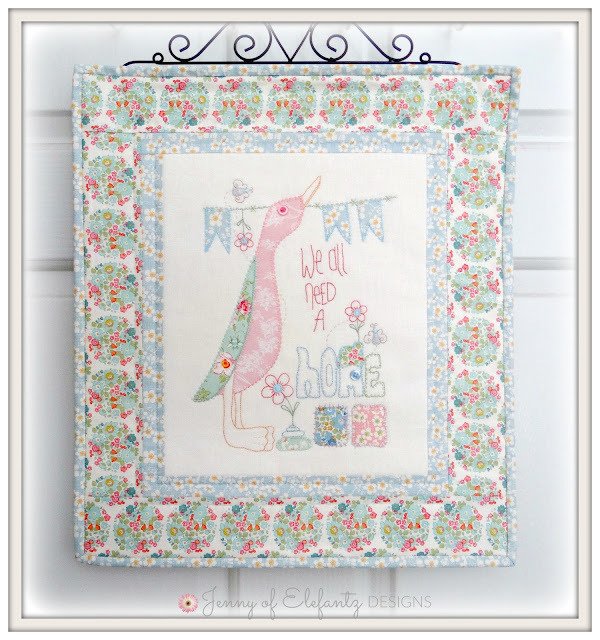 The stitchery pattern for block 1 of "The Love of Home" BOM is still available for free download here in my shop. Block 2 will be ready for you on Wednesday! Hi Jenny,i love this to ,thankyou so much for the tutorial. This is a lovely little quilt. OUCH!!!!! Your poor finger. I hope it is mending okay. Love your mini. So sweet, so you. I have nearly finished stitching mine and I am eagerly awaiting block 2. Thankyou so much for sharing your beautiful work with us all. Oh do hope your finger feels better soon... love the border you chose for your sweet stitchery. This is adorable! Your eye for color is wonderful. I am so sorry about your finger. That can really set you back for awhile. I hope it heals soon! As always your work seems lighter than air. Just beautiful. Hope the finger mends soon. Un panel bellísimo Jenny ,te felicito !!!!!!!!! Hello Jenny! Oh Goodness, I do hope your fingers mend quickly! We tend to overlook how important they are and all of the things they help us do. I absolutely adore your special project hanging on the pretty stand and all, just like they were made for one another. 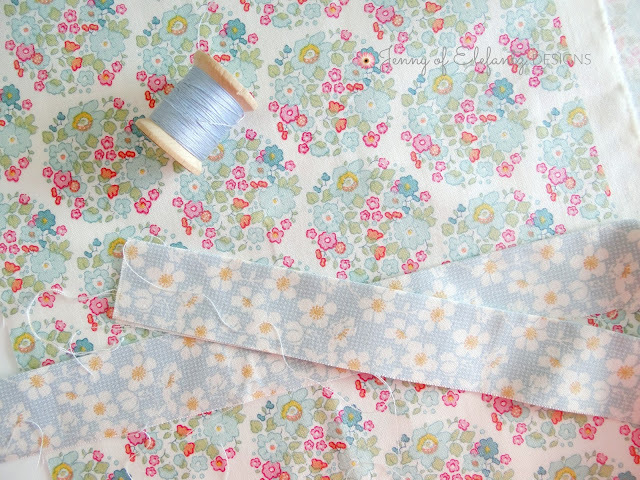 Plus, I appreciated your tutorial on fussy cutting. It is not something I do very often and every variety that is shared is a lesson to try and see if it is right for you. I have a quilt project that is going to have applique and quite a bit of fussy cutting. So thank you for sharing and for sharing yourself. Have a great weekend! I like the fabric you chose. It looks like bushes around the house. =) Thanks for showing your process, always.